This is not about your own safety. I take that as a given and regard glyphosate as one of the safest pesticides ever invented. It is the safety of your plants that concerns me today. I received an e-mail from a reader asking if she might hire me to spray her own large and already beautiful garden. With an interest in six gardens I don’t want any more. I did invite Marie and her husband down to my Open Day when I would demonstrate how she could do it herself. They were a lovely couple and very attentive listeners. They kindly sent me the pictures of me spraying that day. They immediately bought a Berthoud knapsack sprayer and have been using glyphosate for ten weeks now…… as far as I know! 'Roundup' does not know the difference between a plant and a weed. As long as you do (this is a high level skill) then as long as you properly selectively apply it you can easily half the maintenance time for your garden. No longer take all weekend to pull out the weeds. Twice recently ladies have told me that they are convinced that the use of glyphosate will improve the quality of their garden. Can I recommend someone to do their spraying for them? They are frightened to do it themselves and certainly would not trust their husbands who use a knapsack sprayer in rough places with shear abandon. I am afraid that unless you are very lucky and know such a person the answer is no. Most gardeners just don’t understand glyphosate. Most so called experts don’t either (although quite a few use it themselves but it’s not pc to mention it in the media). They are inhibited to talk about it because there are so many idiots around who will misuse it. Nor does promoting glyphosate do anything for their 'image'. In professional circles of garden managers it is widely acknowledged they could not operate without it. Where fools rush in you will find me. Most jobbing gardeners don’t understand glyphosate either. I did know a man who did and asked him why he constantly scrabbled out couch grass at one of his clients. He said that they paid him well and enjoyed watching him working hard in their garden. Some take the puritanical view that gardening should be hard work. More likely a jobbing gardener will claim competence and won’t have a clue. One of the problems is that professional training is geared to farm fields and farmers. Worse it is taught by agricultural engineers and any legal framework is geared to legislation framed with farmers in mind. What they teach is in-appropriate for accurately spraying between clumps of plants in the garden. I bought a knapsack many years ago and found that it came with a constant pressure device to enable me to spray at a constant high pressure. Fortunately I could detach it and it went straight in the bin. It took me years to learn that for the type of spraying I do a cone nozzle is better than the one I was told. And the mathematics of calibrating a sprayer to apply uniform amounts per unit area are for gardeners an unnecessary chore. I personally find that a cone nozzle is more accurate for spot spraying than the generally recommended anvil kind. I recently watched local authority professionals spraying. In a rough area under trees where there was ground cover vegetation. At the pressure they used they were destined to damage some. Similarly a man smoothly glided round town on a ride-on-sprayer killing weeds in road and wall edges and around tree bases. Although I have no criticism of the safety and effectiveness of his work the area of path and wall covered was much greater than the span of the vegetation. Fortunately bark prevents any potential damage to trees - and the pavement comes to no harm! The fact that a good shoulder mounted knapsack sprayer with a long lance can be a very accurate low pressure squirter amongst plants never seems to be recognised. Don’t get me wrong when confronted by larger spaces near plants I might make several pumps with the handle and work with my cone nozzle held a little higher but still directed down. I too used to visit clients at irregular intervals and now go to spray at Lyndi’s, Bolton Percy churchyard and Worsbrough St Mary’s cemetery only once a month. At home I no longer have many perennial weeds of the kind that need to grow large to be effectively sprayed. I prefer in my own garden, at Cathi’s next door and down in the village to spray more frequently and tackle weeds emerged from seed when they are unobtrusive and small. When dead, large weeds often look ugly. I prefer my weeds never to be even noticed. Little and often is a good mantra for weed control. A small weed that emerges from seed might be annual, biennial or perennial. As a weed control problem they are at that time in effect all the same. 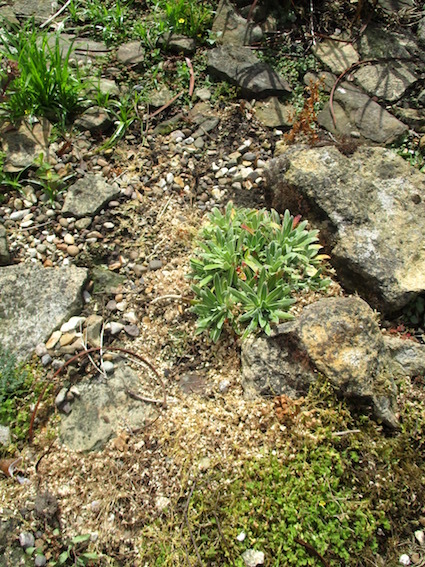 Unlike an emerging perennial weed from an underground structure when it is useless to zap it as soon as it appears, a seedling weed is in a sense a ‘complete plant’ and is extremely vulnerable to even a very weak glyphosate spray. As long as it is green you can spray it any time in the year. At home when weather and weed-wise conditions are suitable I supplement spraying by all manor of variations of hand weeding and hoeing! In summary, if you do your spraying yourself you are more flexible, you perhaps know your plants better than anyone else, it is much tidier and with your own spraying frequency better timed your overall time input will be be less then a visiting ‘expert’. What is more doing it yourself is very much cheaper. A person who sprays for you is likely to be too slow and too careful. He/she will be dead scared that you are a fussy crackpot and that to you a misplaced yellow leaf is a sin. 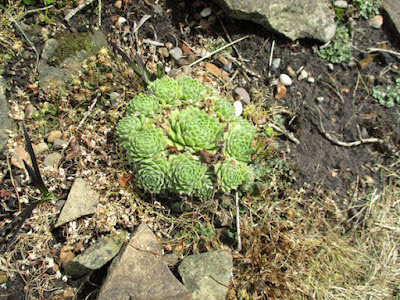 A problem for a professional gardener is that his/her client will have lots of sick plants. None of them will be due to glyphosate but he and his spraying will surely get the blame. 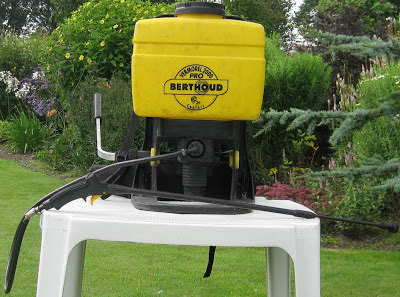 Get a proper professional knapsack sprayer such as the Berthoud pictured. It will be as much as £160. It will be your best investment ever and last you a lifetime. Think what you spend on your mower - especially if you prat about on a ride-on. A good knapsack with its long lance is more comfortable, accurate, versatile, reliable and long lasting. If you are new to knapsack spraying practice using pure water! Go easy at first and limit yourself to open spaces. You will soon become confident. That is not to say that a cheap hand sprayer is not very useful in a very small garden or for special needs such a bindweed control as I explained at the end of this link. In my foolish youth I exclusively used a small hand sprayer for years in Bolton Percy one acre churchyard when it was at the height of its fame. Some worry that in their own wet part part of the country such as Preston that they can never find the recommended six hours of rain free conditions. Don’t worry about it and unless it is obvious that heavy rain is imminent go ahead and spray. The advice is more important for controlling difficult large weeds and is much less relevant to small weeds from seed. Indeed for the latter if a light shower washes the glyphosate to the immediate root zone it might even be better. Standard advice has to cover a wide range of humidity and temperature and all types of weeds. If my sprayed weeds stay dry for an hour I am not too unhappy. Wind is much more of a problem when spraying at high pressure with the nozzle held high as it might be if you are spraying tall extensive vegetation. Do not worry about a light breeze if you are spraying when your nozzle is close to the ground. Where you do need perfect accuracy amongst delicate plants get up early in the morning when it is usually still. Gardeners ask, do they need special clothing and facial protection. I emphasise I am talking about specifically glyphosate when I answer no. Just look at pictures of me spraying - albeit that day I was posing! I do wear normal gardening gear and for me wellies are part of my uniform! If a none gardener can go to his superstore and buy his ‘ready to use’ path clearing cocktail which almost invariably includes glyphosate and spray it with abandon you can see there is no need. Some gardeners swear by hooded guards over the end of their nozzle. I expect they are the ones who use too much pressure or are perhaps unskilled workers who do a lot of uniform monotonous spraying, I saw workers on Madeira spraying under a huge field of bird of paradise flowers spraying this way. Personally I want to see what goes on at the end of my nozzle. Indeed I would not touch guards with a bargepole. I see on web forums gardeners fretting about instructions on professional glyphosate containers that state rates of applications in terms of chemical per unit area. Use the rates of dilution widely recommended for specific uses and endlessly repeated in my own posts. All the rates I recommend work out in actual use at far less than any legal maximums. My own 'bread and butter' rate of dilution is 1in 50 dilution of the professional 360 gm per litre concentrate. 1.This post discusses the speed of action of glyphosate and how its use and effectiveness varies year round. I kick away the canopy to spray. Note you cannot spray within clumps of herbaceous perennials. As an annual the poached egg plants completely dies down in July. You can then spray the complete area (if necessary) before new seed germinates. I only use roundup to paint stumps of shrubs and small trees that I cut down near the soil. I have considered using it more for weed control. My garden is quite small - less than 1/4 acre - so I don't think a backpack setup is practical. A friend of mine recommends what he calls "the glove of death" - a rubber glove topped with a cloth glove moistened with roundup. You just rub your hand on the target weeds. Ever heard of such a thing? Good to hear from a fellow blogger Jason. Of course a knapsack is worthwhile for quarter of an acre! 150 quid for twenty years -£7 50p a year or is that 10dollars? I think gloves are great for very delicate work such as for 'smoothing' a coarse perennial grass that is growing intimately within a herbaceous plant clump or even bruising a mares tail. Couch can so easily be killed by touching..As to a free standing weed from seed I'd rather pull it out!